I love the flavors in this dish, fragrant ginger, with the saltiness from the soy sauce and sweetness of mirin. You don’t need jarred sauces to make delicious stir fry dishes. 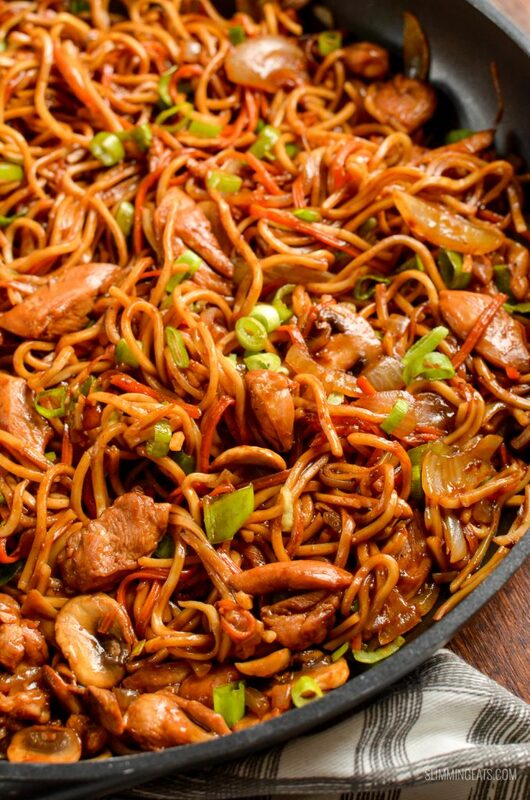 Just basic ingredients can make a really tasty stir fry dish like this Ginger Chicken with Mushrooms and Noodles. Pair your favourite vegetables into this Ginger Chicken with Mushrooms and Noodles to up those speed foods, I love shredded cabbage, broccoli slaw or carrot which I make into little ribbons using my julienne peeler. 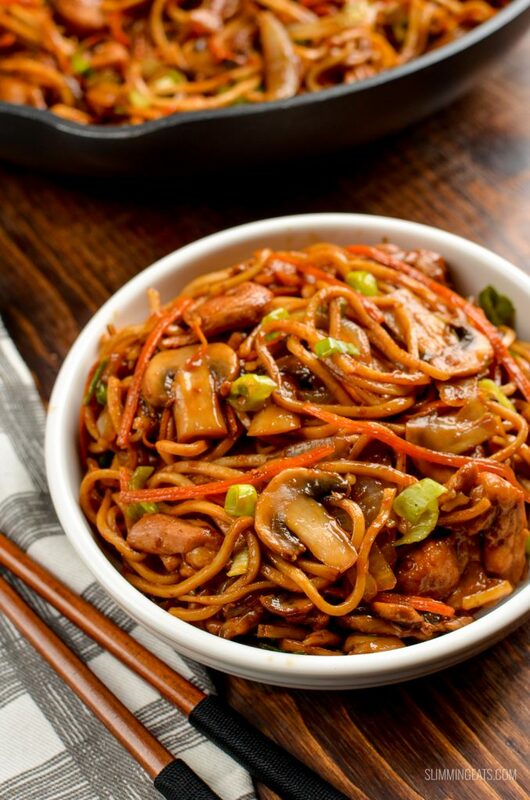 Egg noodles are my preferred choice for this Ginger Chicken with Mushrooms and Noodles. 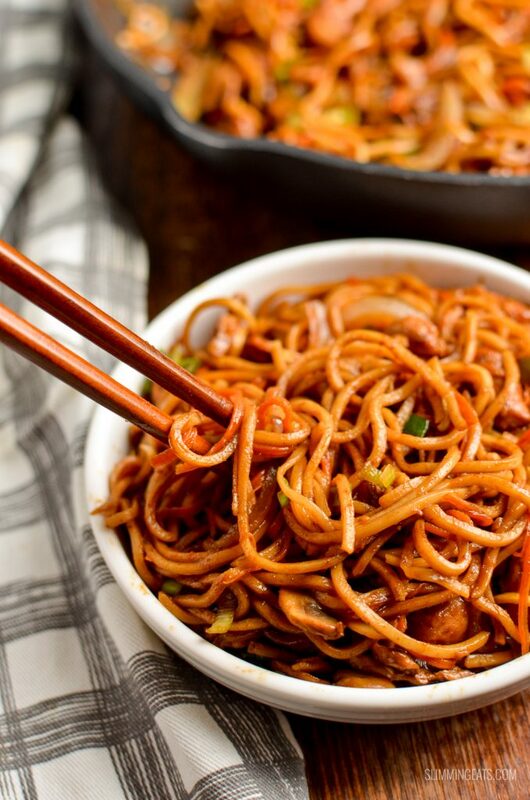 but you can also use a gluten-free noodle of choice, along with a gluten-free soy sauce. 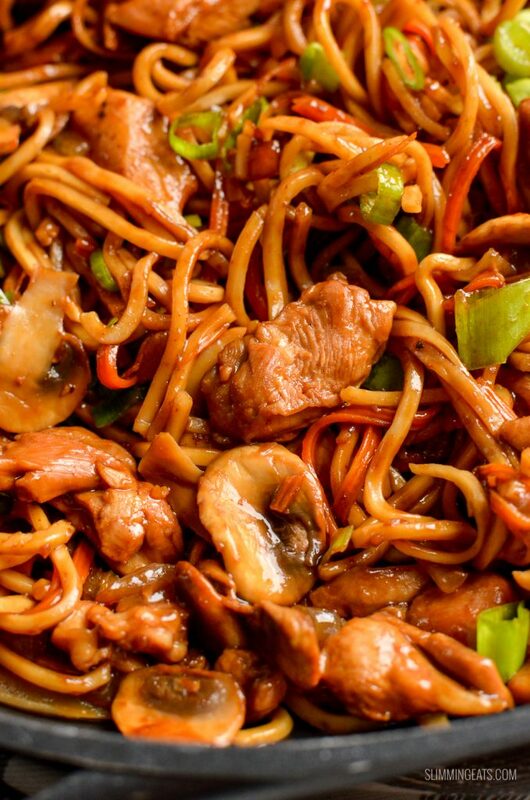 Can I enjoy this Ginger Chicken with Mushrooms and Noodles on a Slimming World SP day? 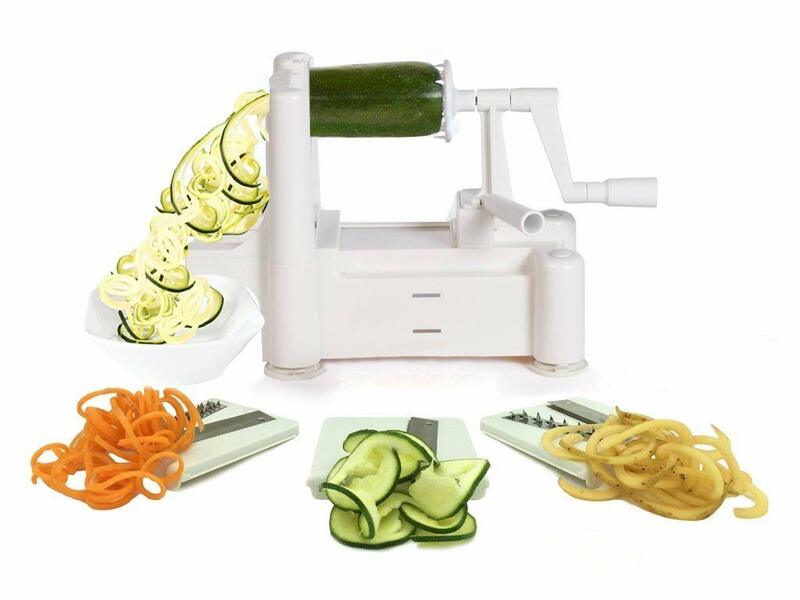 which is perfect for spiralizing various vegetables. It’s super useful to have, for making meals interesting when you want to increase your speed foods. 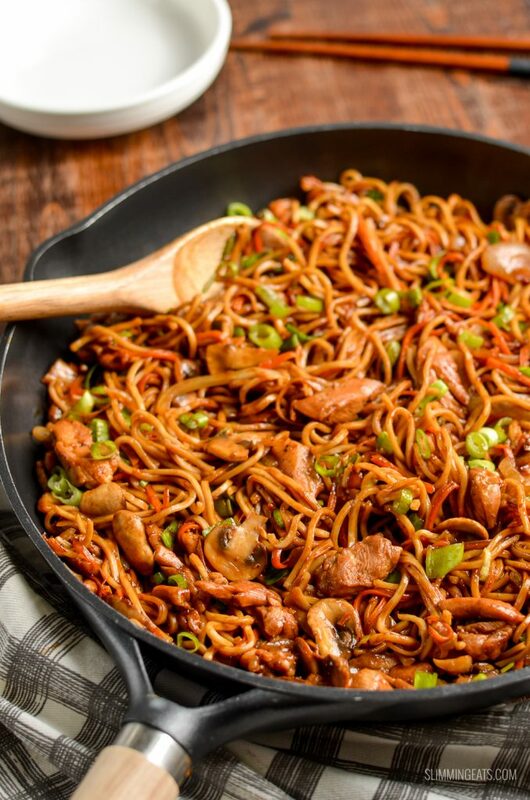 WHAT KITCHEN ITEMS DO I NEED TO MAKE this Ginger Chicken with Mushrooms and Noodles? Combine the water, starch, soy sauce, and maple syrup. Set aside. Cook the noodles as per the packet instructions. Drain and set aside. Heat a large wok or frying pan over a medium high heat and spray with some cooking oil spray. Add the ginger, garlic and chicken and fry until slightly golden. Remove and set aside. Spray wok with some more spray oil and add the red onion and mushrooms and cook for approx 5 mins. Add the noodles and stir to evenly coat. Season with black pepper and sprinkle with spring onions. made this last night for tea and it is LUSH,Jjust as nice as anything form the chinese and my hubby loved it also. Hi, tried this last night and it was fantastic, better than the takeaway. As you said great for kids as my fussy 5 year old loved it too. Made this tonight. Really lovely. Will definitely be one of our regular dinners! Hi, I can’t get hold of maple syrup. Can I use A little brown sugar? yes that should be fine – enjoy! !